Will Birmingham join the National Basketball Association? Jefferson County commissioner Larry Langford informs the Commission that he is working to bring a National Basketball Association team to Birmingham. Langford claims to be in discussion with a group of professional athletes to lure an NBA team to the city. His plans are contingent on the city building a multi-sport facility for the team to play in, however. "It needs to be a 40,000-seat stadium and not a 70,000-seat stadium. I'm working with some pro athletes right now. I'm excited where they are. The mere fact they want to commit that kind of money to it. A 40,000-seat stadium would let UAB and Miles play football games," Langford said. Langford's comments came after Commission president Bettye Fine Collins updated the panel on a special meeting of the Birmingham-Jefferson Convention Complex board. Collins said the board members offered alternatives to a domed stadium, which a majority of the Commission members oppose. "They are looking at a reduction of their Plan A," Collins said. 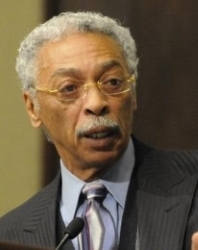 Mayor-elect Larry Langford says there are still discussions with a group of pro athletes about luring an NBA team to Birmingham, contingent on construction of a dome. Langford would not elaborate on the plans but feels strongly there is a demand for professional basketball in Birmingham. "I guarantee you if an NBA team announced they were coming tomorrow morning, you'd have a hard time getting tickets," Langford said. Unfortunately, Birmingham did not build a new arena nor did the city ever obtain a National Basketball Association team.